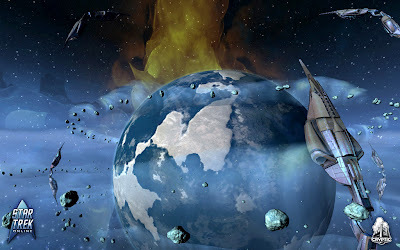 Still a wee bit behind, but this (article which could also be called "look what TrekMovie said a while ago) should get me just about up to date and in place to start updating properly as news happens, woo! 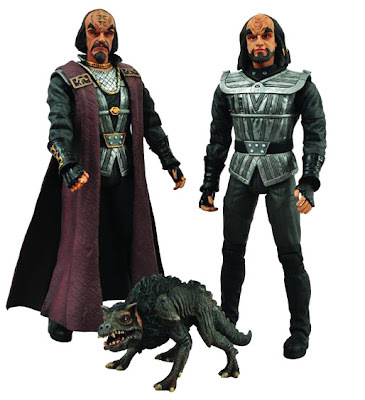 Anywho, first up for product news: Diamond Select Toys have announced a new action figure two-pack, featuring their first character releases from Star Trek III: The Search for Spock, the Klingons Kruge and Maltz. According to TrekMovie.com these figures are "‘one offs’ and not necessarily the beginning of a line from Star Trek III"
Picture c.o. Toy News International's announcement for the two-pack. There will apparently be three other models next year, including one ship and one figurine. 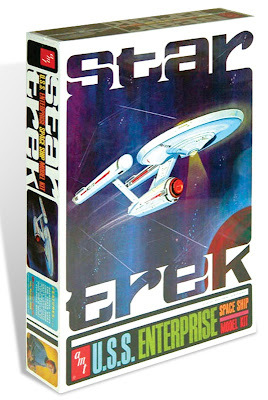 TrekMovie (again) also report another company, Round 2, will be distributing several previously released starship model kits under the AMT and Polar Lights brands. Out later this year will be a re-issue of the AMT 1/650 scale model of the TOS USS Enterprise, featuring new more accurate moulds. It will be available in either a box, or metal tin! 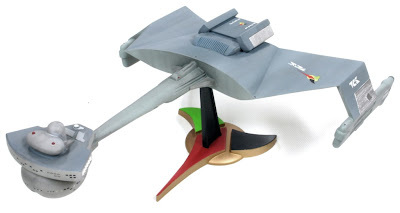 The Polar Lights reissues this year will include the 1/1000 scale TOS Enterprise, Klingon D7 and Enterprise NX-01. These will also feature moulds with improved detailing apparently. 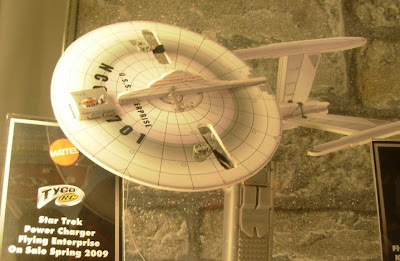 2009 will see a re-issue of AMT's Enterprise-E and Polar Lights' 1/350 scale Enterprise-A. 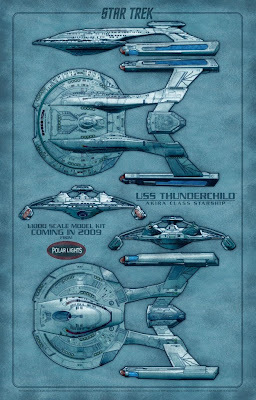 The year will also see the start of new kits starting with a 1/100 scale Akira class USS Thunderchild and in 2010 there are plans for a 1/350 scale TOS Enterprise. 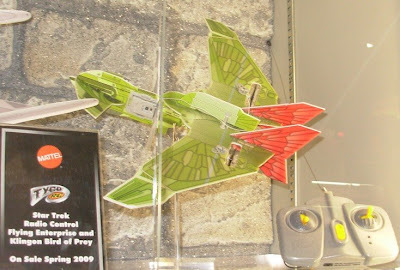 There will also be Klingon Bird-of-Prey versions of the two smaller models and Mattel also has plans for similar products for the new movie design Enterprise and ships from the rest of Trek franchise. 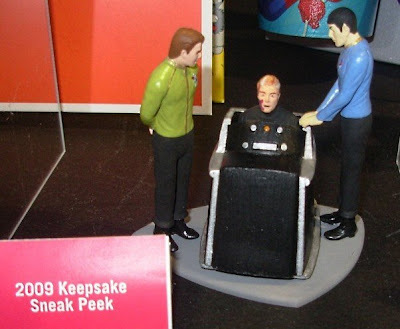 See TrekMovie's report for pictures and video! 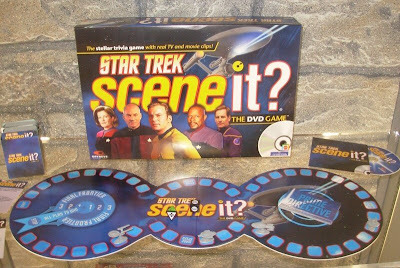 On the Star Trek Scene it? 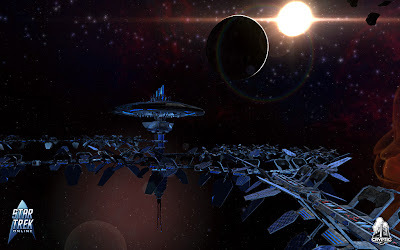 website there is a competition to add new questions to the game, so get your trivia hats on - Can anyone tell me who really likes Bularian canapes? 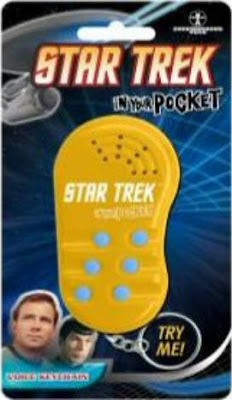 Elsewhere in the Star Trek toy store... the font of all Trek knowledge also reports two companies are producing Star Trek keychain... things. Underground Toys are (in September) releasing a yellow thing with some voice clips (can you sense my enthusiasm for this product...) and Basic Fun will be releasing some figural keychains later in the year. See the site, here, for more.